I loved your guest post on Mogul Mom today! Thanks so much for getting these tips out to everyone. I’m reaching out to you today to find out if you have content posted anywhere about how to get around having testimonials when you are just starting out. My business is getting prepared to launch in the next few weeks. While my partner and I have extensive experience in our field we are creating a new service for the dental community and are concerned about how to build a reputation for being trustworthy without having any clients to brag on us yet. I’d love to know your thoughts on this. Luckily for Natalie (and you), I do happen to have a few ideas to building your online rep when you haven’t jumped out the door yet. Find some folks who can try your product or service free-o-charge in exchange for an honest review. 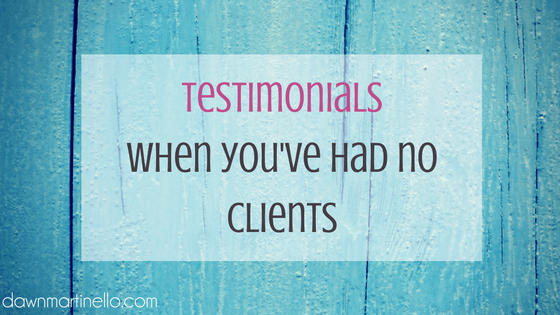 Use these first few happy clients as bubbly testimonials as you role out your new baby for the universe. Be absolutely, positively, unabashedly sure that you continue to get testimonials from people once you’ve launched and the bucks are rolling in. In the beginning, this will be easy because you can email each person as they finish up with you (or in the case of long-term clients, once they’ve been on board long enough to have some say in the matter). When you get busy, you can work in some automation or hire yourself a virtual assistant. Make a list of everything that you do in your current role/business/job. Is there anything that translates to your new schtick? If it does, hustle that person for a expertise type testimonial. Before I opened my virtual assistant company, I built Avon businesses. That had nothing to do with what I was going to start doing as a virtual assistant, but if I had been smart, I would have plucked a few sound bites from all the men and women I helped build an Avon customer base. Why? Because that SKILL is relevant to the work I do now. It’s no different from when you used to write a traditional resume when you had no job experience. What skills can be marketed to your new employer? Figure that out, then mine it for some hot testimonials. When you start your website and blog, make sure you leave comments on. (Save yourself some hassle and get Akismet hooked up right away). Ask a question that’s pertinent to your business and your post. You can pluck those beefy comments and place them onto your raving fans page. You can do the same thing on Facebook and Twitter and just screen capture those comments. Easy. You may not have a product or service yet, but I bet someone’s worked with you in some kind of capacity. If someone has some love to shower on you, capture it as a testimonial. Knowledge on a subject is just as important as anything else, so if someone tells you that you’re the top dog in your industry, you want that on your page. Set up Google Alerts to notify you when you’re mentioned on other sites or in tweets.